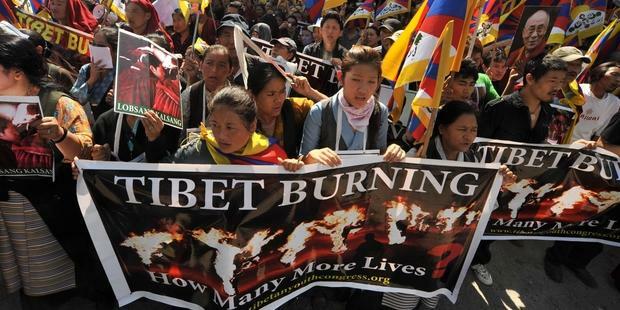 At least 75 Tibetans – including many Buddhist monks and nuns – have set themselves on fire this year. Many shouted for the return of the Dalai Lama and for freedom for Tibetans as they burned and some made the same demands in written statements. This escalation in self-immolations in Tibetan-populated areas in China, including the Tibetan Autonomous Region and neighbouring provinces, saw 24 people set themselves ablaze in November alone. The total number of Tibetans who have self-immolated since 2009 currently stands at 88, a figure that is now rising daily. Bobpa Tsang – not his real name – is a Tibetan activist now living in London. He told Amnesty International how he respects those Tibetan protesters who self-immolate. Tibetan exile Jampa Yeshi committed the ultimate act of protest Monday by setting himself on fire in New Delhi on the eve of Chinese President Hu Jintao’s visit to India. Horrific photographs of his self-immolation [warning: graphic image] quickly spread around the world via the Internet and India’s dynamic press, galvanizing the cause of Tibetans fighting to draw international attention to human rights violations committed by the Chinese government in Tibet.